When Songkran comes to Pattaya you have 4 options, stay and enjoy it, hole yourself up for the duration, leave the country, or simply leave Pattaya. If you’re reading this I guess you’ve already made up your mind. You’re out of here, no Songkran madness for you. So where will you go, how far do you have to go to escape the Songkran festivities ?. Leaving the country is an unnecessary upheaval, and lucky for us, there are some convenient hideaways very close to Pattaya. The journey from Pattaya to Koh Samet takes less than 3 hours, and getting to Koh Samet is relatively easy and hassle free, making it the most convenient place to escape Pattaya’s Songkran festivities. I’m not going to try telling you they don’t celebrate Songkran on Koh Samet, but I will tell you it’s not going to be the mayhem experienced in Pattaya, there will be no crowds of people hurling buckets of ice cold water at motorcyclists, and no crowds lining the highways with water cannons, because there are no highways. And because the crowds traveling to Samet for Songkran are mainly like-minded folk, they are also there to escape the mayhem. You’re going to need to book early, there will be a mini exodus of ex-pats fleeing Pattaya during Songkran, and it’s destination Koh Samet. If for any reason you are going to try and get a walk-in deal you are taking a chance, but there’s no reason to leave it to chance. Agoda have a extensive choice of hotels on Koh Samet, in all price ranges. If I wasn’t going to hit the streets with my camera this Songkran, I might have instead made it an excuse to visit Koh Mak for the first time. Everything I’ve read about Koh Mak suggests this is an ultimate “get away from everything” destination, no crowds, no nightlife, just beautiful sandy beaches, crystal clear water, and plantations of rubber and coconut. Koh Mak is so highly rated one British national newspaper placed it in the top 10 of their worlds most beautiful beaches. Getting to Koh Mak: Located about 20 kilometers south of Koh Chang, it’s obviously more of a trek than the journey to Koh Samet. But you can take a ferry or speedboat direct from Laem Ngop, or you can take a 40 seater wooden boat or speedboat from Koh Chang. If you want to take the ferry direct from Laem Ngop, do make sure you are at the right terminal, otherwise you may find yourself on the Koh Chang Ferry. Take a look at Agoda’s accommodation deals on Koh Mak. Pattaya has a rather long and drawn out Songkran period, Thailand’s national Songkran “New Year” is April 13th, and runs through to the 15th. For various reasons districts and sub-districts throughout Thailand hold their main Songkran celebrations at staggered periods. The official day in Pattaya is usually the 19th, but the celebrations start tentatively in the main tourist and nightlife zones as early as the 11th. By the 13th the roads will start to become congested as revelers take to the streets to give each other a good drenching. Commuting in to and around Pattaya from this point will become increasingly difficult and carry the risk of getting extremely wet. The 18th and 19th will see the city absolutely gridlocked as the water fight gets in to full swing. If you would like to avoid the whole thing you should leave on the 12th or before, if you would like to avoid the worst of it, leave on the 15th or 16th and return on the 20th. You could escape to the peace and solitude of a beach resort in Na Jomtien or Bang Saray, but forget trying to commute back to Pattaya. Get a room with a view and watch Songkran from above: Even if you don’t like to participate, Songkran is a spectacle well worth watching. So why not not book a room with a view on Pattaya Beach Road, and watch from your very own “house seat” and be entertained by the Songkran theater. Not everyone leaves, I for one will be prowling the streets with my camera, but for many ex-pats who have seen and done Songkran before it’s just too much. Most feel that one day is enough, and that the festivities are way too boisterous in Pattaya. 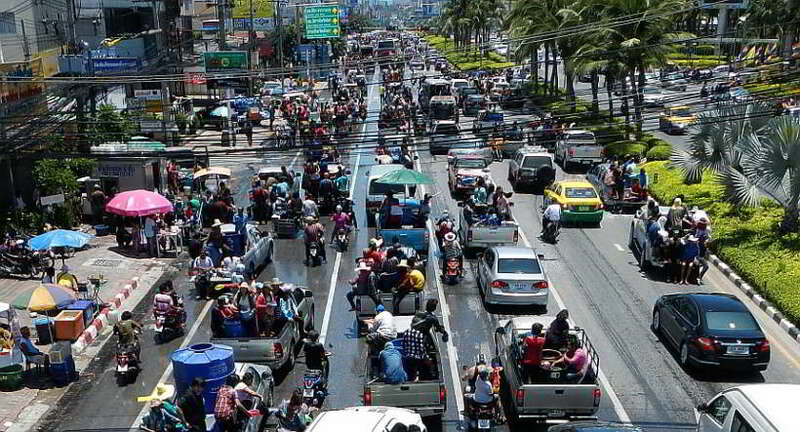 Songkran really does bring Pattaya to a standstill, every road and every soi in the city is reduced to a slow moving parade of revelers drenching each other with water (see photo below). For those who do not wish to participate the only options are to stay indoors for the duration, or get out of town. Should I stay or should I go ?, there’s one thing for sure, unless you intend joining in the Songkran festivities, you won’t be going anywhere in a hurry (see photo above).